A Toronto-based mobile startup wants to transform your high-powered Android handset into a toddler’s play toy. Kytephone is betting that parents with youngsters will want the new app to transform older Android handsets into a kid-friendly smartphone for ages six to 11. More than half of children under eight are using a mobile device for media consumption, Kytephone claims. This app isn’t just a child lock for your Android handset, it’s a fully redesigned user interface suitable for kids. The idea for the app started as a simpler user interface for the elderly, explains CEO and co-founder of Kytephone, Renat Gataullin. But he realized that would be a shrinking market as the current young generation would be tech-savvy as they aged. “We came up with this solution for parents to gradually and in a responsible manner introduce technology to their kids,” he says. Kytephone makes an Android handset more kid-friendly. In addition to a new user interface, the app also gives parents the ability to supervise their children’s smartphone use through a Web browser. That includes location tracking on an interactive map, permissions settings that can be changed over the Web, a limited phone call list, and instant photo sync of snaps taken with the smartphone’s camera. Kytephone says children won’t be able to circumvent the app, even by restarting the phone or pulling the battery. For parents who feel their children are already adept at using the iOS or Android user interface, they may appreciate the surveillance features, Gataullin says. Those features are there for parents to decide to use, or not. But is cell phone use safe for kids? Health Canada advises measures to reduce radio frequency exposure from cell phones, and says kids are more sensitive to environmental agents. It recommends limiting the length of cell phone calls, using a hands-free headset, or replacing phone calls with text messages. The World Health Organization labeled prolonged cell phone use as potentially carcinogenic last year. The main concern with cell phones comes from placing it up against the head during phone calls, he adds. There’s no particular concern related to Google’s Android OS or the Kyptephone app. 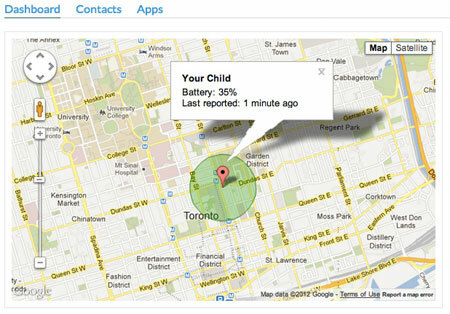 Kytephone allows parents to locate their children’s phones on a map. Though some parents may be concerned about their kids growing up too quickly. Others may be more pragmatic about it. “Parents are using us an excuse to get a new phone and give their kids their old Android handset,” Gataullin says.